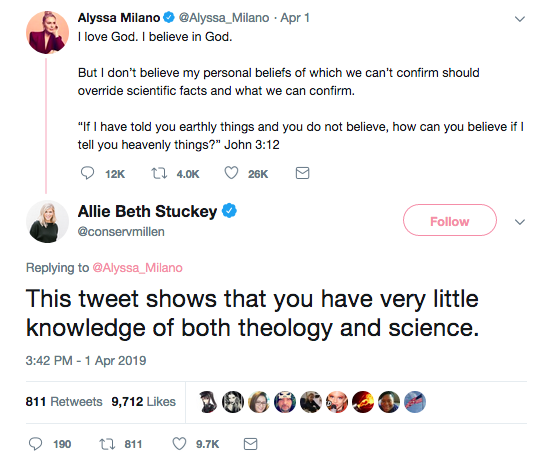 Actress Alyssa Milano has now marshalled the Bible and science to support her pro-abortion position. Unfortunately, she is wrong on both accounts. The Bible and science, rightly understood, are totally pro-life. Tweeting on April 1 (with no apparent irony intended), Milano said, “I love God. I believe in God. “But I don’t believe my personal beliefs of which we can’t confirm should override scientific facts and what we can confirm. As for Milano’s love for God and belief in God, that is between her and God. At least she is not denying His existence. That’s a step in the right direction. As for her quoting the Bible, while the words are taken out of context and, in reality, work against her, I’m glad that she feels that quoting the Bible is important. We agree! It’s just that she could not have chosen two worse witnesses to defend the “right” of abortion. To repeat: both the Bible and science, rightly understood, are pro-life. First, the Word teaches that God carefully and lovingly formed us in the womb (Psalm 139:13-16). Third, it teaches the potential destiny of each child in the womb (Genesis 25:23; Jeremiah 1:5; Galatians 1:15). Fourth, it teaches the importance of caring for “the least of these,” the most vulnerable and hurting (Matthew 18:1-6, 10; 25:31-46). Fifth, it teaches us to stand up for the innocent being led to slaughter (Proverbs 24:11-12). Sixth, it teaches us that God hates the shedding of innocent blood, especially of babies (see, for example, Jeremiah 7:30-34; 17:1-6; Proverbs 6:17). 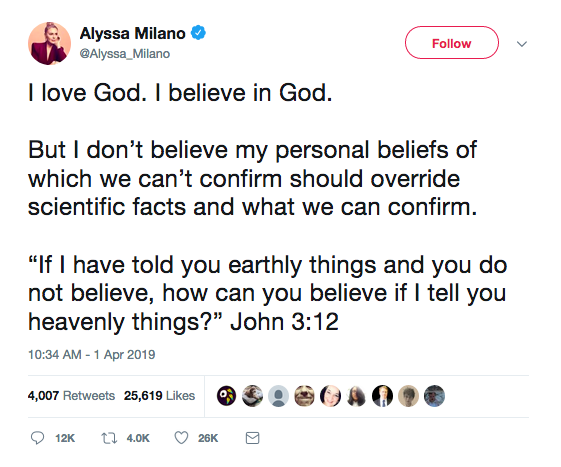 As for science – or, in Milano’s words, “scientific facts” – what exactly did she have in mind? What “scientific facts” support abortion? Can anyone name one? Over at the Daily Wire, Amanda Prestigiacomo compiled some of the better responses to Milano’s tweet, including “So… When does a baby in utero become ‘scientifically’ human enough for you to protect their life?” (Elisha Kraus) And, “Who wants to tell her that the fact that human life begins at fertilization has been scientific consensus for almost a century?” (Lauren Enriquez) And, “If these babies aren’t humans, someone should tell them to stop kicking the sh*t out of my bladder” (Emily Zanotti). 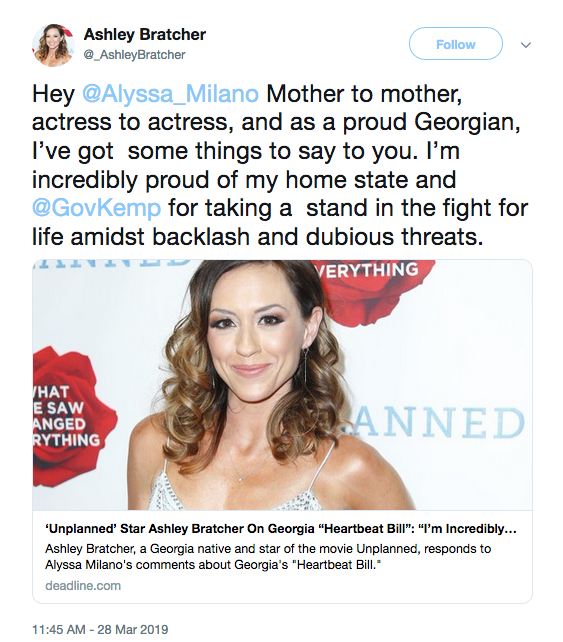 At present, she now has over 100 actors who have signed her protest against Georgia’s strong pro-life bill. In effect, they have signed their names against life, against science, and against God’s Word. Dr. Michael Brown (www.askdrbrown.org) is the host of the nationally syndicated Line of Fire radio program. His latest book is Playing with Holy Fire: A Wake-up Call to the Pentecostal-Charismatic Church. Connect with him on Facebook or Twitter, or YouTube.